One of our students was having trouble installing Joomla in cPanel, so we created this tutorial for him. Scroll down and create a new database user. Use the password generator for a good secure password. Save this password in a secure place. We’ll use it for an upcoming step. Access the public_html folder and click the Upload button. Or if needed, access a sub folder of the public_html folder if you’re setting up a test site and/or if another site is in the public_html folder. Select the package, then Extract it. You’ll see the Joomla installation script open. Fill in the fields, then click Next. For both of the above, be sure to copy the full name (including the account prefix – i.e. the part before the underscore). The rest of the fields can be left at their defaults. If a connection can’t be made, ask your web host if any of these should be changed. In most cases, the default will work well though. It’s usually best to not install sample data. Congrats, you’ve just installed Joomla! If you’re setting up a multi-lingual site, use the “Extra steps: install languages” feature. Finally, use the “Remove installation folder” feature when done. 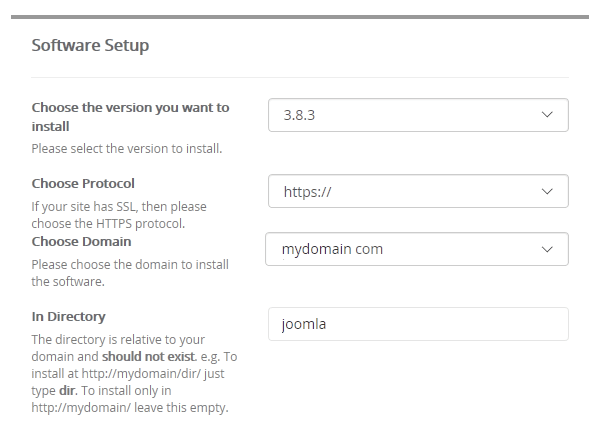 The quickest and simplest way to install Joomla! is with the Softaculous App Installer available in cPanel. Softaculous provides an easy, one-click installation that is the best choice for most website owners. Log in to your HostPapa Dashboard and click My cPanel. Scroll down to the Software section and click Softaculous Apps Installer. Expand the Portals/CMS menu and click Joomla. On the Overview tab, click Install Now. Choose the version you want to install – In most cases, choose the default option, which is the latest stable version. Choose Protocol – If you use SSL on your site, choose https://. Choose Domain – If you have more than one domain, choose the correct domain. 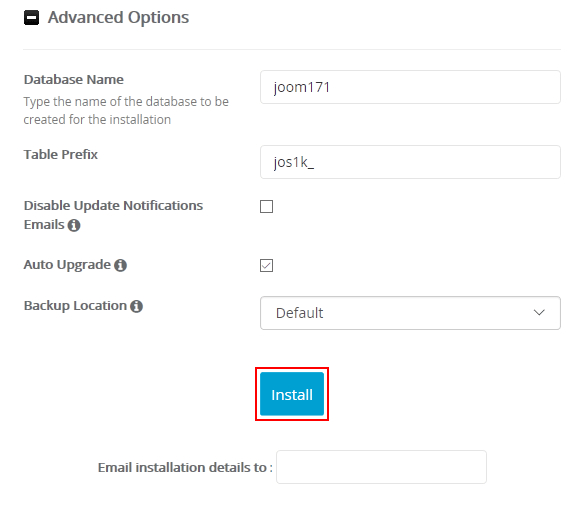 In Directory – To install Joomla! at the root of your site, leave this blank. To install in a subdirectory, enter the name of a subdirectory that you have not yet created. 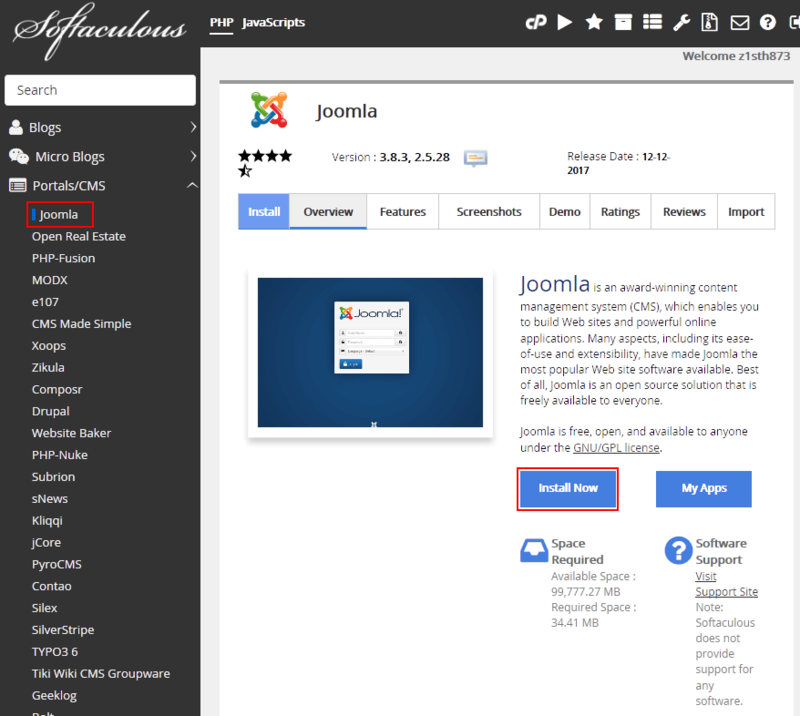 In our example, we’re installing in a subdirectory called joomla. Site Name – Enter the name of your site. Site Description – Enter a short description of your site. Import Sample Data – Choose whether to install sample data and what type. Admin Username – Enter a username for the admin user. Admin Password – Enter a strong password for the admin username. Real Name – Enter the admin user’s real name. Admin Email – Enter the email address of the admin user. Select Language – Select the correct language for the Joomla! back-end. You can let Softaculous choose the database settings. If you want to manually enter these details along with upgrade, notification, and backup settings, click Advanced Options. When you’re finished entering settings, click Install. 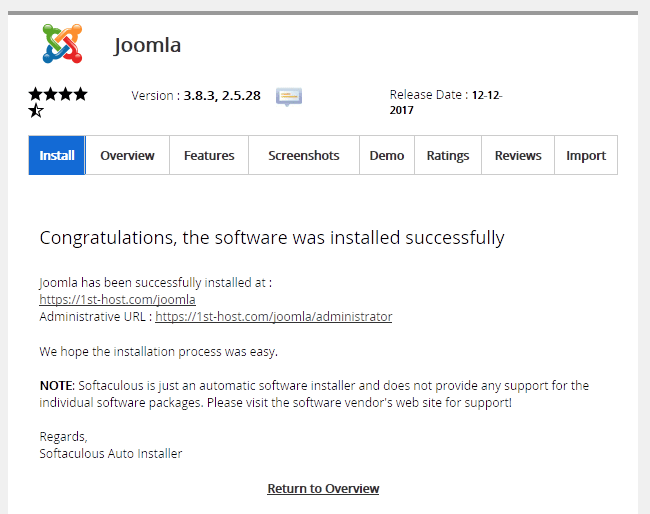 When the installation is complete you’ll see a success message and links to your Joomla! site and Joomla! administrator back-end. For information about how to set up Joomla!